They say fortune favors the bold. I can't think of anyone bolder than the New Order, can you? Didn't think so. Don't be surprised, then, when it seems like we've always got luck on our side. I received a report from Agent Loroseco Kross. He doesn't have much in the way of ganking resources, but he makes do with what he has. Loroseco's preferred method of ganking is to slowboat in a Catalyst all the way to his target. 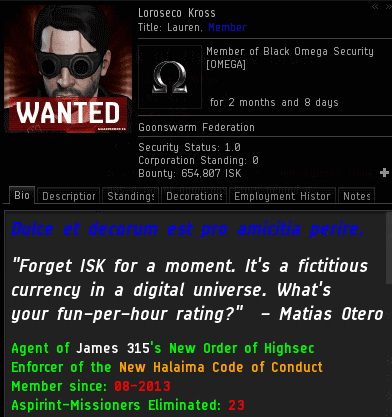 Loroseco has positive sec status, so he can do this without being tackled by Faction Police, but any miner who isn't AFK for a very long period can easily escape. 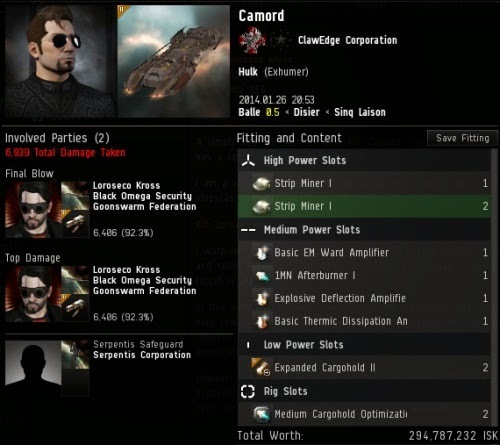 Loroseco landed 30km from an unlicensed Hulk in an asteroid belt. Lacking a propulsion mod, Loroseco's travel time was substantial. The illegal miner was indeed AFK. However, it took Loroseco so long to get within blaster range that the miner eventually returned to the keyboard and started to warp out. It would've been pointless for Loroseco to use a warp scrambler at this point; he was too far away to kill the Hulk, and CONCORD would've stopped the gank before it could begin. Loroseco had no reason to believe this gank could be completed successfully. ...No reason, that is, except for his total faith in the power of the Code. Whether it was by luck, chance, karma, fate, or whatever you want to call it, the asteroid prevented the carebear from escaping. Loroseco finished slowboating over to the Hulk and opened fire. Whether you believe in the New Order's mission or not, there's no arguing the facts of what happened to the Hulk. Justice was served that day. Rebel miners, bear this in mind. The New Order is smarter than you, and it's luckier than you. Whatever you think is going to happen during your illegal mining op, I guarantee you the exact opposite will happen. Buy a permit and hold it close. Funniest thing on the Internet today. I desperately want to see the tears in local, if any. They would be glorious.